TonerTopUp Refill Toner Instructions. All you need to know! We show you the different ways below and how our starter toolkit can make the most complicated very easy! There are various methods of refilling toner cartridges depending upon the make and model of your machine. You always need to find, or make, a filler hole into the toner chamber so that you can pour the toner in. All our bottled toner comes with a funnel top so actually pouring in the toner is easy. If you are lucky your cartridge will have a visible, existing filler hole for the toner chamber. In that case you have only to remove the plug and pour in the toner. Our instructions will say something like "Unplug and pour". You may need to use pliers to remove the plug and you should be careful not to damage it or it will leak. Overall though, these cartridges are extremely easy to fill. Often manufacturers have not been quite so kind. (Bear in mind that their main income is from selling expensive cartridges!) You may have to undo some screws and remove a cover or some other complication before you can get at the filler hole. Usually this is not very complicated. If it is we will suggest Method C instead! Quite a few cartridges, especially for the popular Hewlett Packard and Canon machines, have been designed to make them difficult to fill. These are marked as "Melt hole and pour". Our starter kit of tools is available to help you do this quickly and efficiently, priced at £9.50 plus VAT. In the toolkit we provide a specially designed soldering iron with a cutting tip. You just plug the tool in, wait for about 3 minutes for the iron to heat up, and then hold the tip gently against the cartridge in the appropriate place for a few seconds. It will cut a neat disc of plastic from the cartridge wall giving you a filler hole. The key tool in our starter kit is a standard soldering iron with a specially designed tip. This makes it very easy to make a hole in the cartridge. You give the toner bottle a good shake to get air into the powder so it flows easily, remove the top and seal and screw on the spout shaped cap supplied with the toner. 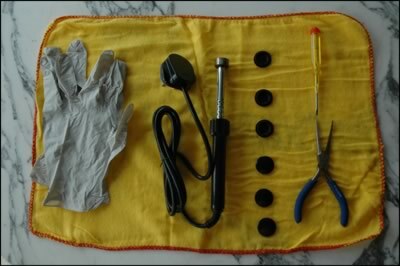 We provide a few extra tools in the kit which you will not routinely need but can be handy on occasion. In case the plastic disc you have removed in melting the hole falls inside the toner chamber, we provide a screwdriver and a pair of long nosed pliers so you can locate and remove it. We also include a pair of latex gloves to keep your hands clean, a duster to help you clean any spills, and a couple of sheets of newspaper in case you have none handy to work on!...... Oh yes!...... there is also a small surprise to keep you occupied whilst you wait for the tool to heat up! There are a few models where it is not possible to top up the toner yourself, perhaps because the old toner and new toner shouldn't mix or because a chip deep inside the cartridge must be changed. In these cases, where possible, we supply a complete cartridge. We currently do not supply remanufactured cartridges on a general basis. You have probably got the idea now that the manufacturers are doing their best to protect their large toner cartridge profits from people like you who want to refill their own cartridges and from the remanufacturers who offer a better priced replacement. In recent years they have added electronic chips to some cartridges which monitor how much toner is left. It would be fine if that was all they did but most of them also close down the machine when it goes low....... and refilling it won't reverse that. So for some machines you need to screw or plug in a new chip before your refilled cartridge will work. We supply the chips seperately where it is always needed or else, where one chip lasts for several refills, we draw your attention to this so you can choose if you want to replace it or not. Some models use a separate developer as well as a toner. In that case we normally supply both together. Developer is the magnetic mediun that transports the toner. Other models use a carrier which we supply in a separate bottle. This is mixed with the toner in the toner bottle before refilling. Again the carrier is the transport medium for the toner itself. This reason it is bottleed separately is usually to ensure that the precise amount need is used. If premixed toner and carrier are bottled together there is a danger of uneven distribution of the heavier toner affecting the performance. Clearing up if you have an accident! If you spill some toner whilst filling, the chances are it will be on both the cartridge and your work surface. We suggest you deal with the cartridge first. Finish filling it, gently brush the excess toner off the cartridge onto the newspaper on your work surface. Wipe round the filler hole area and seal with grommet or tape. Now you won't spill any more! Take the cartridge outside (out of the sun) and blow off the remains of any toner. A final wipe with your duster and it can go back in its bag. For the work area brush any toner onto the newspaper if necessary. Fold the newspaper in on itself and throw it away. Clean any residual small amount of powder with a duster or vacuum cleaner. If you have toner on your hands or clothes wash with cold water. Hot water melts the toner and will set it. There are answers to a lot more of the questions that you may have on our Frequently Asked Questions page. It does not cost a lot to try out TonerTopUp so why don't you go to our Product Selector page and buy a trial bottle of toner for your machine right now. For most popular models, we give detailed instructions on how to go about it. But there are a lot of cartridge types and we have not yet produced detailed instructions for all those for which we can supply TonerTopUps. So if your model is marked as "No instructions available so far", do not give up because the chances are it is very easy and it is likely that we will be able to get instructions sorted out for you. Email or phone us to tell us what you have and we will see what we can do. We may be able to give you a special deal to help us get the instructions sorted out. We aim to get instructions sorted out for all the cartridges still in use over time. It is easy to avoid it though. What you need is a second hole in the cartridge, this time into the waste chamber. Before filling the cartridge you shake the waste toner out into a bucket and throw it away. You seal the waste hole with a grommet or tape in the same way as the filler hole. It only adds a couple of minutes onto the operation. We suggest that you don't bother to do this the first time and run your first cartridge as far as it will go without. Just turn it upside down before filling and give it a good shake to distribute the waste evenly in the chamber because it tends to build up at the two edges. You can then see whether and when emptying is going to be necessary for your model of machine. Because it is necessary for ours, we make the waste hole at the first refill and then it is just part of the routine. We suggest you always have at least one spare refilled cartridge ready to be used in your machine as you do not want to have to refill a cartridge in the middle of a print run. We also suggest that you always have one spare new OEM or remanufactured cartridge as well. Your refilled ones will go on beyond their first life and will save you money.......but they will not go on for ever! Sooner or later something will deteriorate inside and you will need to start another one. We do a lot of printing and have a stock of 15 - 20 cartridges that we refill in batches. It is more efficient to do several at once when you are in the mood! When the remanufacturers rebuild a cartridge, they have to disassemble it to a greater or lesser extent. They cannot really supply you with a cartridge with a hole melted in it! However practical that might be, it wouldn't look right! Of course this allows them to replace the internal components and so to guarantee another normal lifetime. It does however disturb the internal workings and so has to be done precisely right if there are not to be problems. Using our TonerTopUp kits you are getting the residual life out of the cartridge using the existing components without disturbing them. Because these usually last considerably longer than one load of toner, you will normally be able to get several more lifetimes before you decide that the quality has dropped below your acceptable standard and you discard the cartridge. Do prepare your work area first. The OPC cylinder of your cartridge is light sensitive and will be spoilt if you expose it to strong, direct sunlight. It will be fine for ten minutes or so in ordinary subdued room light but you should keep it inside its opaque bag most of the time. Choose a shady area out of the wind to work. A garage is ideal, but the kitchen sink or a table indoors are possible if you are careful. Do remove anything that might be spoilt from the immediate area and do spread out a layer of newspaper on the surface in case you spill some toner. We all do occasionally! Don't squeeze the bottle hard! Toner powder flows like liquid if it is first shaken so it has air in it. If it is not flowing well then do not give it more than a gentle squeeze or you will repeat the tomato ketchup trick but with toner powder! Instead just tip the bottle the right way up, tap it on the surface and give it a gentle sideways shake. This will loosen the powder again so it flows once more and you can continue pouring.